Provide comfort for the family of June Fowler with a meaningful gesture of sympathy. Troy- June A. 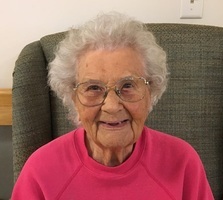 (Chamberlain) Fowler, 93, passed away peacefully February 5, 2019. She was born April 18, 1925, in Benton, the daughter of Almon and Lelia (Clifford) Chamberlain. June was actively involved in the Legion, the Ladies Auxiliary, and the Senior Citizens Club of Troy. The community could always count on June for her famous chocolate donuts or potato salad for May breakfast or town meetings. She worked at the Unity Hatchery and Troy school. Together with her husband, Maynard, they operated a farm in Troy for many years. In addition to her parents, she was predeceased by her husband of over 40 years, Maynard; brothers, Ernest, and Almon Jr.; sisters, Lucille, Edith, Helen, Thelma, and Pauline. June is survived by her sons, Larry, of Troy, and Ronnie and his wife, Barbara, of Dedham; two sisters, Gladys Benner, of Fairfield, and Christine Ravin, of California; seven grandchildren, LeRoy and Erik, of Troy, Charelle, of Palermo, Bridgett, of Hampden, Kimberly and Kristi, of Dedham, and Kelly, of Bangor; fifteen great-grandchildren; sisters-in-law, Ethel and Marilyn Chamberlain, as well as several nieces and nephews. The family greatly appreciates the amazing care that June’s son, Larry, provided for her. He put his life on hold by allowing her to stay at home as long as she could. We encourage you to share your most beloved memories of June here, so that the family and other loved ones can always see it. You can upload cherished photographs, or share your favorite stories, and can even comment on those shared by others.